I may have mentioned this before, but my mom used to have a thing for Mark Stevens. I knew her for over 50 years before I discovered this little fact that only came out when she asked to borrow my copy of 1946s The Dark Corner. It still makes me shake my head. You think you know a person! Kathleen: "I've never been followed before." Brad: "That's a terrible reflection on American manhood." Private Investigator Brad Galt (Mark Stevens) has problems. He can't turn around in his NYC office without some copper checking up on him due to a prison record back in California. He has an ex-partner who framed him. Hell, he has enemies he hasn't even met yet. It's a good thing his secretary Kathleen (Lucille Ball) is a girl with brains, a big heart and good legs. Stauffer: "I need two yards, powder money." Galt learns of his current trouble when he's being tailed by hired muscle (William Bendix). His name is Stauffer, but we'll call this character "White Suit" pursuant to his sartorial choice for following guys at night. The ex-partner Tony Jardine (Kurt Krueger) is more than a part of Brad's shady past. Jardine has been creating crime and deceit right here in NYC. 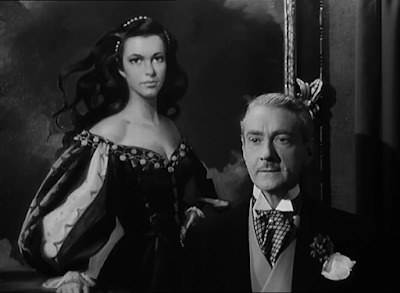 His less than honourable actions with wealthy women has not gone unnoticed by gallery owner Hardy Cathcart (Clifton Webb), nor have his charms been lost on Cathcart's young and beautiful wife Mari (Cathy Downs). How the paths of these disparate character criss and cross over the landscape and close in on the hapless Galt is the story of The Dark Corner. Cathcart: "The enjoyment of art is the only remaining ecstasy that is neither immoral nor illegal." Among the supporting cast you will enjoy Constance Collier (Stage Door) as a wealthy art patron, Reed Hadley (I Shot Jesse James) and his voice, as a police detective, and an unbilled John Russell (TVs Lawman) as a uniformed officer. Based on a story by Leo Rosten (Captain Newman, M.D.) 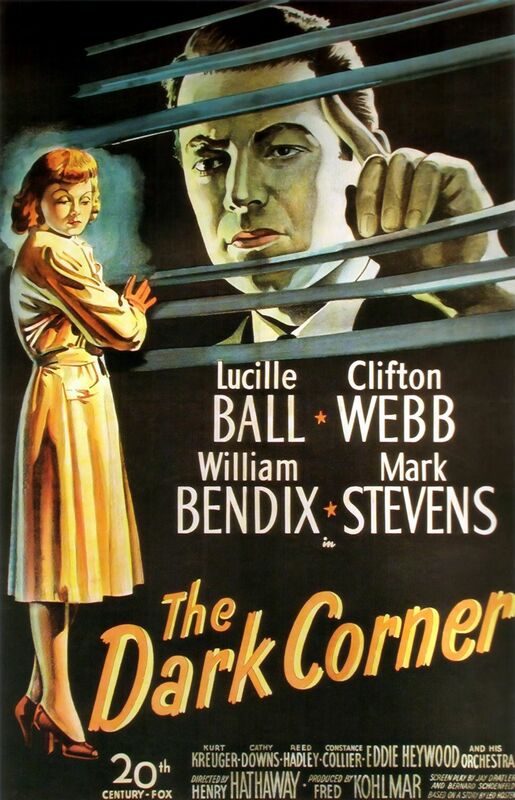 with a screenplay by Jay Dratler (Pitfall, Laura) and Bernard Schoenfeld (Phantom Lady, Down Three Dark Streets), The Dark Corner bristles with 1940s slang and snappy one-liners. 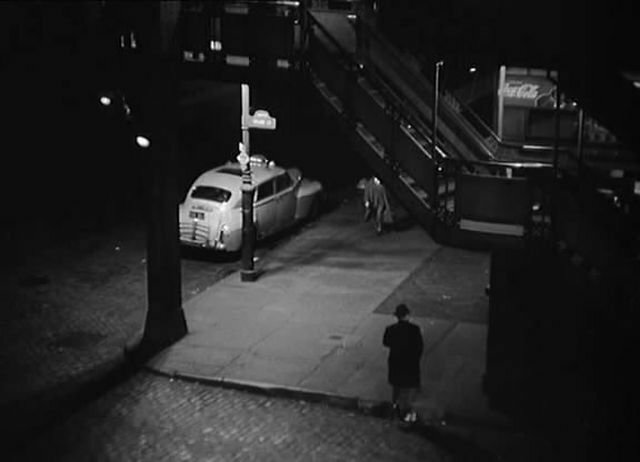 The moody cinematography is from one of my favourite purveyors of the art, Joe MacDonald (My Darling Clementine, Panic in the Streets). Director Henry Hathaway specialized in nifty noir during this period of his long and varied career. Whether it be the docudrama style of The House on 92nd Street, 13 Rue Madeleine and Call Northside 777 or the more melodramatic crime stories like Kiss of Death and The Dark Corner, they all feature a grittiness served by location filming. The Dark Corner takes its audiences from crowded penny arcades to exclusive art galleries, from crowded walk-ups to swanky penthouses, through nightclubs and office buildings as our story takes place. Brad: "There goes my last lead. I feel all dead inside. I'm backed up in a dark corner, and I don't know who's hitting me." For music, Cyril Mockridge reached into the 20th Century Fox vault for Alfred Newman's Street Scene for the theme. It takes you directly where you need to be by dropping you right in the middle of the city streets. 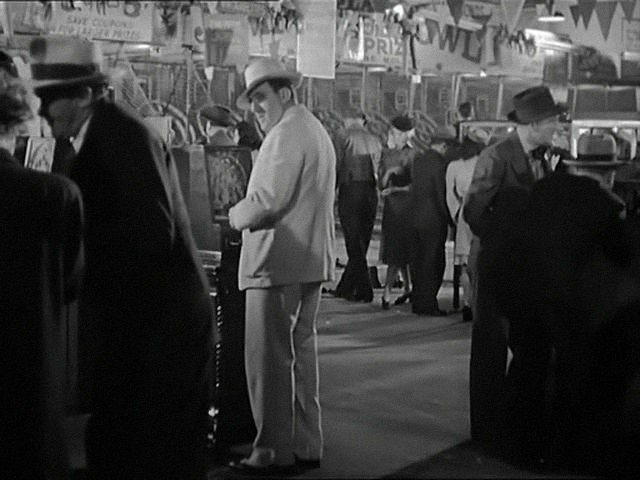 The background music played by orchestras, radios and recordings is a mix of Harry Warren standards and, in what I think is a cheeky move considering what happens to Stauffer's white suit, Duke Ellington's Mood Indigo. A special treat in the movie is the appearance, too briefly, of jazz pianist/composer Eddie Heywood appearing as himself in a nightclub scene playing his Heywood Blues. Of Lucy's dramatic pictures, I believe this and the following year's Lured are her only mysteries. As much as she shone in other dramas and especially in her comedies, I like her in this murky world. She is both of it and above it - a most interesting dichotomy. Kathleen: "What's done to you is done to me." Fans, you don't have to wait long for this film-noir treat. 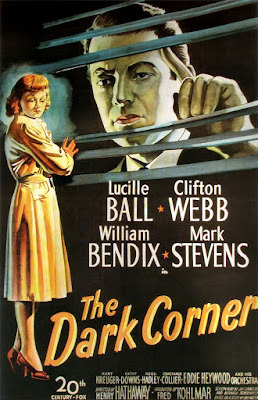 TCM is screening The Dark Corner on Tuesday, August 2nd at 8:00 PM as part of the Summer Under the Stars salute to Lucille Ball. Always enjoyed this film. My favorite of Ball's dramatic performances (Lured is close behind). Ah, I see we are two minds with but a single thought. I enjoyed this post, CW. You've made me want to watch The Dark Corner. I never saw the appeal of Mark Stevens ( personally I go for Don Ameche ), but we all have our own tastes...and that's interesting that your mother kept her "crush" a secret for so many years. I hear you. I could easily fall for Don Ameche. However, I think I could pal around with Mark Stevens. Ah, the inestimable YouTube, the answer to so many of our prayers. I think you'll be okay with Stevens in this picture. Lucy as Kathleen likes him, and we like her so that should be enough. Now, I'm a bit of a no-fan o' Lucille Ball, but I think I'll give this one a shot...looks fun! Yeah? My hubby keeps saying he's not a Lucy fan, but stuff like this does not drive him from the room. Hope you enjoy the movie. This was a very cool movie. Clifton Webb and Lucy were the two best actors in it. I'll have to disagree with your mom. but Mark Stevens didn't really call my attention. Maybe if I try again? Stevens appeared in a variety of films and, I think, acquitted himself well, but never broke through to the top rung. Later he would direct B features and television. I can see what my mom sees. We both go for those dark-haired, good looking boys. A great selection CaftanWoman. What a cast ! Clifton Webb,William Bendix, and the versatile Lucille Ball! 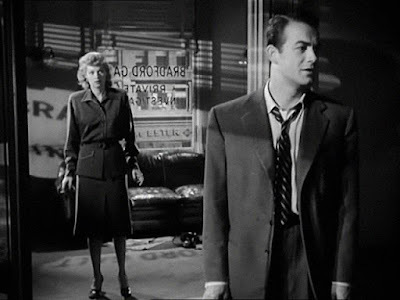 You are right about her being good in noirs like this one and Lured. Thanks. Lucille was a very special actress and I'm not sure we always appreciated her, even though we always loved her.